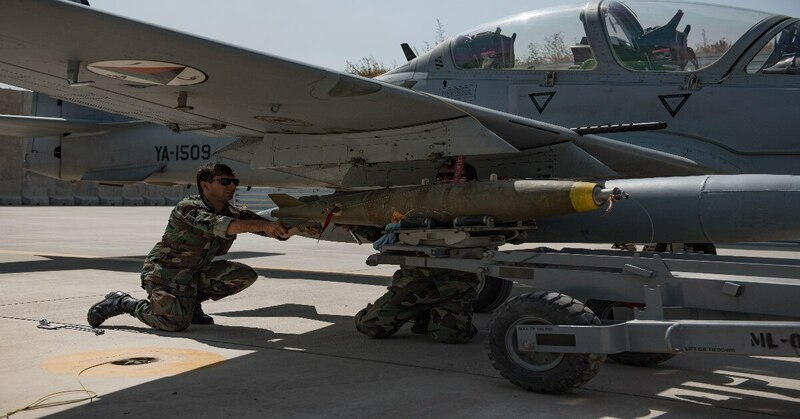 Afghan Air Force pilots recently had another leap in capabilities: they employed laser-guided bombs from their A-29 Super Tucano light-attack aircraft, according to officials involved in NATO’s Resolute Support mission. ”This was the first time that [Afghan] pilots employed guided live bombs utilizing the on-board Forward Looking Infrared system,” Maj. Nicholas Plante, a spokesman for Train, Advise and Assist Command-Air, said in a statement to Military Times. In this exercise, the pilots shot off GBU-58s, which are 250-pound laser-guided bombs. The weapons hit all targets, according to a Twitter post by Resolute Support on Jan. 4. Advisors with TAAC-Air conducted training with their Afghan Air Force counterparts to increase accuracy and offensive capability. “The exercise included two Afghan Air Force A-29s with an Afghan pilot in the rear seat of each aircraft responsible for operating the Forward Looking Infrared system and the laser designator,” Plante said. Although a coalition adviser was piloting each aircraft during this training flight, the planes will have all-Afghan crews when combat missions occur in the future, Plante said. Less than two years after flying its first combat mission, the Afghan Air Force’s A-29 Super Tucano aircraft are playing a key role in supporting Afghan soldiers on the ground. Before the Afghan pilots carried out this mission, advisers “conducted many training flights simulating weapons employment to reinforce the tactics and procedures prior to using live weapons,” Plante said. It’s important to note, however, that the targets for this exercise were pre-planned, and “accurate coordinates were known before takeoff,” he added. Afghan Tactical Air Coordinators, capable of coordinating close air support from forward locations, were not involved in this training iteration. The spot gives terminal guidance to a bomb, and can be provided by the aircraft that deploys the munition, or another aircraft altogether in what’s called a buddy-lase. The Afghan Air Force’s A-29 has a mountable targeting pod under the plane’s engine that can provide laser guidance through both a self-lase and a buddy-lase, according to Plante. For this training event, the Afghan pilots managed to use a buddy-lase from their wingman aircraft. Although further employment of these weapons by Afghan pilots will be based on tactics unique to the combat situation on the ground, the ability to use precision guided munitions would be a critical tool for the NATO-backed Afghan government, according to TAAC-Air. The Afghan Air Force must start maintaining its own aircraft and stop relying on contractors hired by coalition forces, according to a report by the Defense Department Inspector General. The development demonstrates an increased independence within the Afghan Air Force, Plante said. The A-29 pilots now offer Afghan National Security Forces support in areas where fighters on the ground were previously dependent on coalition aircraft for close air support. The A-29, designed to be highly maneuverable and capable of flying at low altitudes, is a key platform in coalition advisers’ attempts to develop an organic close air support capability for Afghan forces. The aircraft began combat operations in Afghanistan in April 2016, and comes with .50-caliber machine guns, 2.75 inch Rockets, and 250 or 500-pound general purpose or precision-guided bombs, according to the Department of Defense.